a graphic representation of inhaled and exhaled carbon dioxide concentrations in the form of continuous waves. Normal capnogram. A, Carbon dioxide cleared from the anatomic dead space; B, dead space and alveolar carbon dioxide; C, alveolar plateau; D, end-tidal carbon dioxide tension (PETCO2). From Dorland's, 2000. /cap·no·gram/ (kap´no-gram″) a real-time waveform record of the concentration of carbon dioxide in the respiratory gases. Normal capnogram. (A), Carbon dioxide cleared from the anatomic dead space; (B), dead space and alveolar carbon dioxide; (C), alveolar plateau; (D), end-tidal carbon dioxide tension (PETCO2). measurement of carbon dioxide. See capnograph. 1. a radiograph of the abdominal cavity taken with negative contrast in the peritoneal cavity. See also pneumoperitoneum. 2. continuous measurement of carbon dioxide concentrations in the exhaled air especially of anesthetized animals. 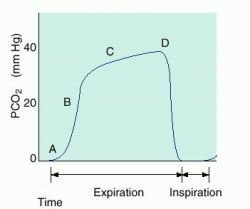 2] at the end of the expiration without presenting inclination in the curve of the capnogram in phase 2. The cuff can be monitored using a capnogram for any rupture or displacement. 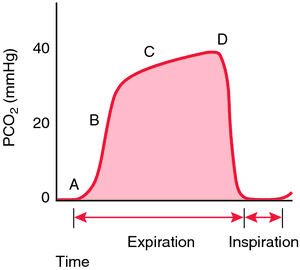 Most commonly seen in clinical practice is the time-based capnogram (see Figure 1, above). Neural network analysis of the volumetric capnogram to detect pulmonary embolism. 2] and expiratory flow measurements to generate volumetric capnogram waveforms and numerics. A capnograph produces both an EtCO2 value as well as a waveform, or capnogram. Stable capnogram was established before proceeding for scan; 10 min. Following insertion, the position of the cLMA was checked for airway patency by either observing the patient's respiratory movement and the capnogram when breathing spontaneously, or in apnoeic patients observing for chest expansion and the capnogram during manual ventilation. End tidal carbon dioxide using side stream capnogram. After insertion, an initial assessment of ventilation was made after the device had been connected to the breathing system by either observing the patient's respiratory movement and the capnogram when breathing spontaneously or, in apnoeic patients (most cases), observing for chest expansion and the capnogram by gently squeezing the reservoir bag.